On this page another big Ichneumon Wasps. This wasp can be over 3.5 centimeters long. 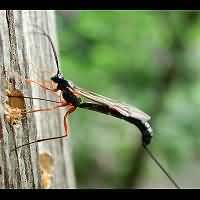 The ovipositor is very long too and powerful. It is believed this probably is a member of the Ephialtes genus. The Ephialtes species deposit their eggs in the larvae of various Mason Bees. 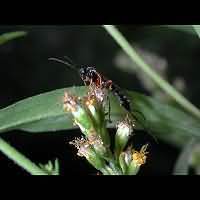 The Ephialtes wasps track them down and use the long ovipositor as a drill and then lay an egg inside the larva. In the three top pictures one of the biggest parasitic wasps to be found in Holland and Belgium. From the pictures we could measure it quite accurately and it turned out to be well over 7 centimetres, including the ovipositor. 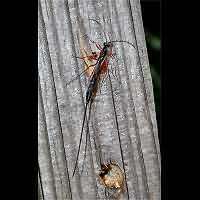 This ovipositor by the way is by itself responsible for more than half of the total length. 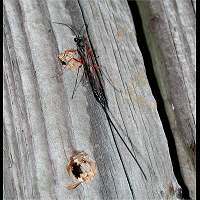 When drilling, the actual ovipositor is taken out of its cover and placed between the legs to drill into wood. The cover is proudly held in an upright position. 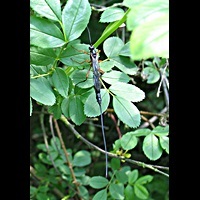 The black line between the legs is the actual ovipositor.